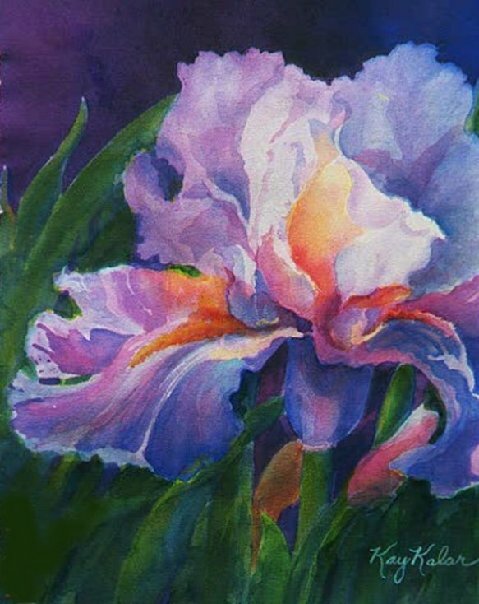 Sun rays dancing on vibrant rose blooms, sensuous iris swaying in the breeze, subtle watercolor tones contrasted with the vivid intensity of flowers, plants, and outdoor scenes. These things capture my heart and soul, bringing me – and thousands of others – joy and peace. 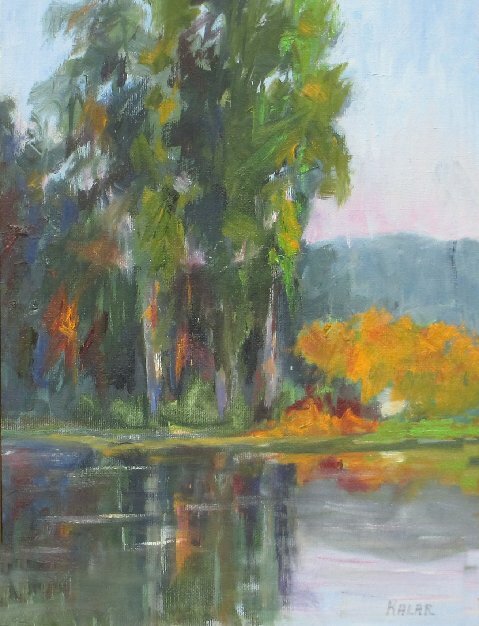 Lucky for us this is a part of the natural world that also inspires artist Kay Kalar of Fallbrook. CA. Born and raised as an only child in the central valley of California Kay married her high school sweetheart after he graduated from Stanford and she from Fresno State. They had two children, a boy and a girl. It was at a committee meeting for Valley Children’s Hospital that she saw watercolors by the host Nicolas Boghosian (who now owns a gallery in Carmel). She knew at that moment she had to learn to paint like that. She was able to get in with Nic’s popular watercolor teacher Carlene Kostiw studying with her for a number of years. She was a superb colorist as well as teacher and became Kay’s friend. Kay also took drawing and watercolor from James Soares, considered a great teacher in the basics and beyond. Kay traveled with her husband as his company completed projects in different areas where she was able to find and work with artists throughout the state. One of the most influential on her work was Elizabeth Tolley, a master in design and composition and all elements of painting. 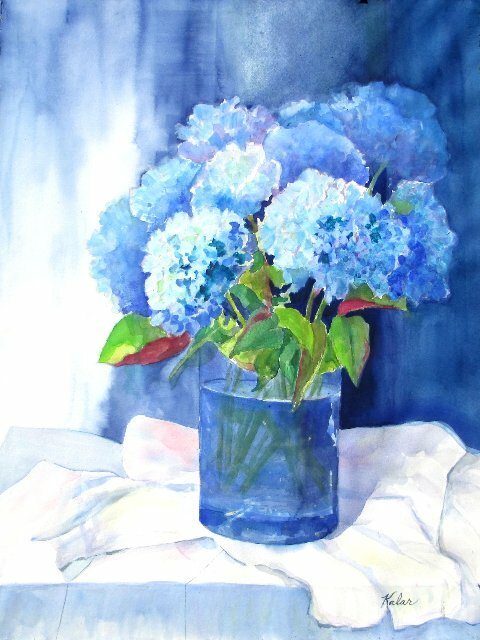 She gives a nod to Elizabeth Kincaid, a noted colorist who does big bold florals and still lifes with loose colorful backgrounds. During this time too, Kay was able to take week long workshops and classes from many renowned teachers, Jeanne Dobie, Robert Reynolds, Sally Marcellus and others. Kay began showing in several valley galleries and did a number of one and two woman shows. She won some best of shows and first places in competitions and, was guest artist for a number of garden shows and other community venues. 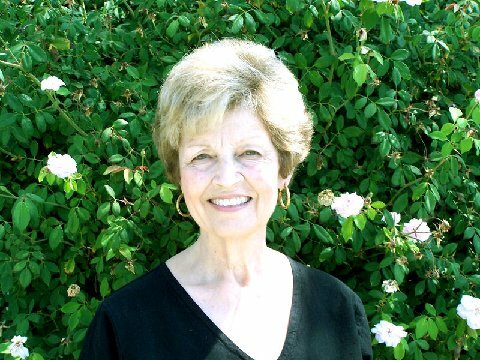 She was one of the founding members of The Art Stand, a co-op gallery of Central Valley artists. Nine years ago, her husband’s business brought them to southern California. They settled in the charismatic art town of Fallbrook. 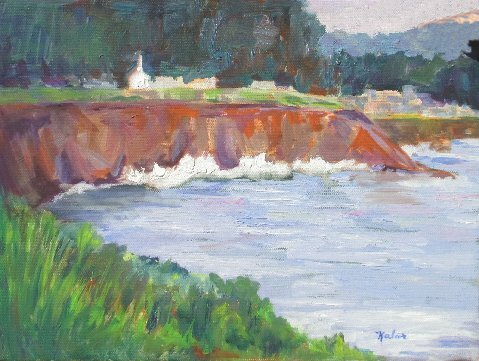 Kay shares, “It is the perfect spot for me.” She became a member of the Brandon Gallery on Main, worked with various art committees and showed her work in Pinnell Gallery. 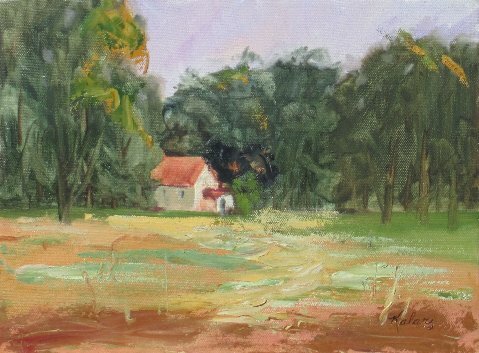 During this time, she pursued oil painting and pastels along with her beloved watercolors. She studied with local teachers Rich Stergulz and Jack Ragland and took wonderful workshops at the Fallbrook School of the Arts with well-known teachers Donna Zagotta, John Salimien and Karen Vernon. Kay’s art is as vivacious and lively as she is. Her compassion for people, causes and community are legendary. Once you meet her and experience her art you will be as big a fan as I am – guaranteed. LK: What medium(s) do you work in? How did you decide to work in that space? KK: Early on I worked in watercolor, then added oils and pastels. I love any art medium and in addition to my more classical works, I am doing a lot of experimentation with mixed mediums, metallics, specialty products, yupo (plastic paper), stencils, inks and gold leaf for special effects. LK: Is there a specific artist, person or place that inspires you or your work? 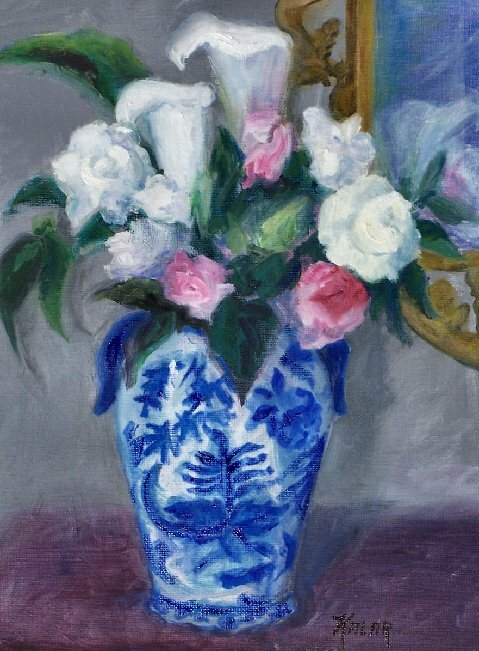 KK: I am inspired by so many artists and study their works constantly; John Singer Sargeant, all the early California Impressionists, Monet and the early Impressionists, Wolf Kahn and many more, Turner, Mary Cassatt, Winslow Homer. LK: Do you have a favorite piece that you have created? Tell us about it. Can you send me a high res JPG of it? KK: I get emotionally involved with my paintings and so they are all favorites! Working on Aquaboard has been a lot of fun. Aquaboard watercolors do not require glass and the colors stay quite brilliant. 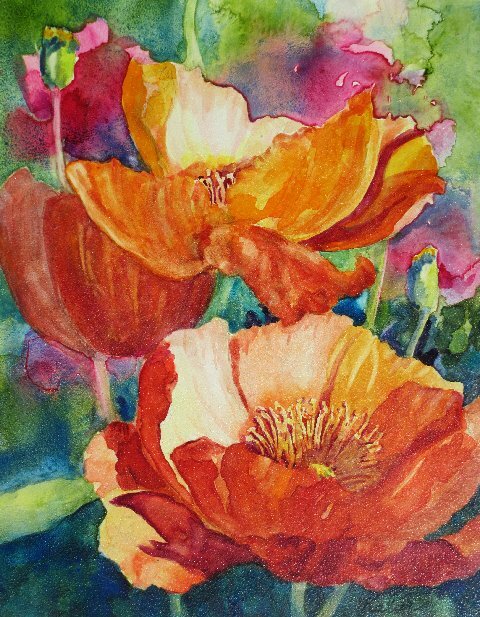 I am sending an Aquaboard painting, Spring Sing, Orange Poppies. 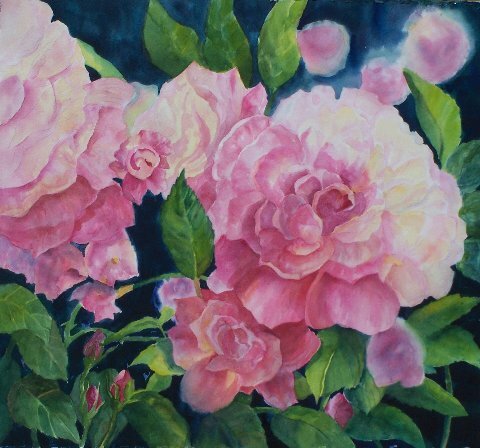 Another favorite is Lost in A Rose, a large painting that won my first Best of Show ribbon. Later one of my collectors saw this painting which is not for sale and commissioned me to do a large sized to order similar painting for her. LK: Is there a specific designing experience you can tell us about? One that stands out to you from either transforming you as an artist, or just a special project. KK: I love composition and design. A big influence on my design work is workshops taken from Libby Tolley, mentor and personal friend. She says “Design is Everything” and has really taught me about the importance of designing for maximum impact. Working with Libby was indeed a transforming time in my development as an artist. Design is considered every time my paintings are started and when teaching my students as well. We as artists can be directors who lead the viewer’s eye around the painting and keep the viewer in our painting too! It’s about so much more than just splashing paint onto a surface. LK: If you could travel anywhere in the world to see a famous piece of art, where and what would it be? Why this piece of art? KK: Paris to see the Monet’s and to visit Giverny and if possible, paint there .I am moved by his works and also by his gardens and home. A day living in that beautiful piece of work, his home and gardens, would be amazing. I am always impressed by the way Monet and the Impressionists changed the way artists look at and interpret color and light. LK: What’s your creative truth? These are words/pieces of advice that you would encourage the next artist with… Words that you live by for creating. KK: My art and faith are deeply inter-related. My art helps to see things more clearly and appreciate them so much more and it is all very spiritually connected to my deep faith in God. Capturing the essence of a moment in time and bringing that subject or scene into something of interest to others is what I love to do, it is a very spiritual endeavor for me. I love that art has taught me to see nuances, colors and truths that I did not see before I started painting. My students are encouraged to enjoy the process. Looking back, the journey and the people along the way, the fun of learning as you go, these things are as meaningful as the beautiful finished paintings you will make one day. LK: Tell us about your work in progress. I always have a number of works going at once. Currently those are some oversized florals, some floral still lifes, a portrait of my granddaughter and one of my daughter and a series of Coronado homes and gardens. I love to do big bold florals with loose dark rich backgrounds and that is on my easel now along with a couple of oil landscapes started. Our daughter, Vicki Meadows is also an artist and relocating to Southern Ca soon. She created and has been selling from the Red Door Studio and I am very excited to be working on some collaborative art projects with her. LK: Were you always interested in art? In a few sentences tell us about how you started. KK: Since childhood, I have loved art and have always had art projects going. My more professional interest began upon seeing those watercolors mentioned before and knowing I HAD to do that! I have worked hard at finding fabulous teachers and workshops and have learned so much from each of them. Their influences are seen in my work today. I have been blessed to work with so many great artists who have shared so generously. LK: What are your passions? KK: God, people, art and of course my family! A passion is working with new artists, encouraging and affirming them while teaching them solid art principals. Painting is my passion! I also enjoy writing and cooking, anything creative! Other passions are reading, learning, theology, Bible study, art study and mentoring. LK: What is one of the hardest challenges you face as an artist? KK: As a creative person, I have ideas galore and never enough time to pursue them all! Time for it all and choosing which of the many ideas to do is my biggest challenge. LK: What is one of the most rewarding elements you take away from doing what you do? KK: Making beautiful paintings is pure joy! I love getting into that ‘zone’ where painting and thinking of nothing else, losing all track of time. Being a part of the art journey of so many others now is really rewarding too. Teaching is exciting and I love my students; encouraging and affirming is my style and they all respond so beautifully. Teaching all levels from beginners to advanced is such fun! Most of my students are adults but there are a few young aspiring artists! I appreciate my students who always encourage and support each other. LK: What is one quality you feel is key in succeeding at your craft in today’s creative scene? KK: Perseverance and hard work. Also networking and sometimes acting ‘out of the box’. Seizing opportunities when they come along and running with them is important also! LK: If you could be another artist (dead or alive) for a day, who would it be? Why? How does other art inspire your work? KK: Monet, so I could live in Giverny and be surrounded by that beautiful artist environment which he created. How exciting to be painting one of his paintings so filled with innovative light and color. I study other art and artists all the time, doing so is a great inspiration and learning tool. LK: What advice can you share with other artists about what you’ve learned from your journey? KK: I share with my students to enjoy the journey! Enjoy the frustrations and successes knowing you are learning from them. Embrace the wonderful people you will meet along the way, the classes and workshops, the pleasure of learning and eventually mastering these skills. The journey is as joyful as the arrival! Savor and embrace it. KK: I would encourage new artists to find good classes or workshops and to learn everything that they can. I would tell them to really learn about art, not to just take classes that are about being splishy splashy. Once some basics and fundamentals are learned, then you can get into the more creative aspects. I also encourage students to find someone who will help them find and develop their own style, not just copy what some teacher is doing. Find someone who will encourage, affirm, uplift and make the process fun as well as educational. LK: Have you been fortunate enough to have a showing or more? KK: Yes I have had many one and two woman shows in the central valley. 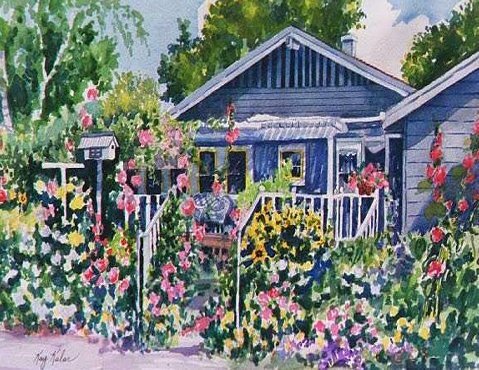 I have also been featured artist for the Fresno Philharmonic garden tour and many other garden tours, guest artist at Wine and a Bite art walk in Fallbrook and other community venues. Work has been shown and sold in four galleries. My work has also been shown in Best Of Magazine. KK: There have been so many, the latest big wow has been how much fun and exciting it is to teach others and pass along the joy and knowledge. Another recent wow, having giclee prints made of my paintings and having them look just like the originals! I am enjoying being able to sell these to people who would like more affordable art. And, I also have a line of cards which I sell by mail and The Find at the Fallbrook Art Center. My originals are for sale too and even though I have sold many, selling a new painting is always a wow moment. LK: What price range is your work available in? KK: My work ranges from $200 to the $3,000 range. Giclees on watercolor paper are available from $50 to $300 currently. I love to do commissions. LK: Do you offer art classes –either group or private? Where? KK: Yes I do joyfully offer watercolor classes. I am currently teaching three classes a week at Hobby Lobby in Temecula (Classes are three hours each). I also offer one class a week in Fallbrook. Frequently groups request workshops. I am excited to be working with the wonderful Fallbrook School of the Arts on some upcoming workshops. A workshop on Big Bold Beautiful Close Focus Flowers is offered September 27th and 28th. You may contact Fallbrook School of the Arts to register at 760-728-6383. Space will be limited. All levels will be welcome. LK: Where can we see your work? 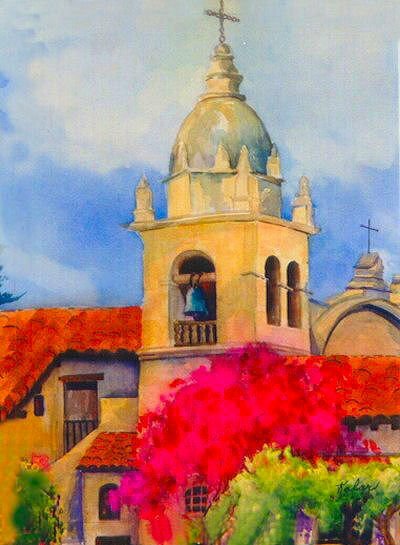 KK: The Fallbrook Library Art and Cultural Committee is having a watercolor show in July and August. It is an invitational and they will be inviting 6 or 7 regional watercolorists to participate. Each artist will have 5 or 6 large paintings or more small ones on display. The show will be up for two months. The Reception for the show will be July 18th. You can email me at Kaykalar@aol.com or phone me at 760-728-7304 for more information on any of my work or classes. I can send you a sheet of images upon request. Some of my collectors have commissioned “Favorite Things” paintings. For these, I take photos of some objects that you love and create a very personal statement for your home. Thank you for your article about Kay, I’ve learned more about her and her artistic talents. I always wanted to paint, but never found the time. Kay has incouraged me to pick up my brush and follow my dreams, She guides and inspires her students to allow their own individuality to flow. I’m happy to be part of her class and knowing her and her caring ways is certainly a plus.